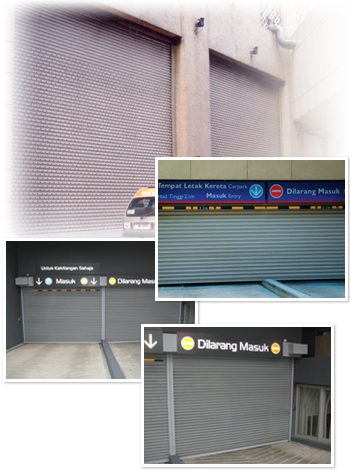 Hightex® Dynamic Heavy Duty shutters are designed to provide security to industrial and commercial areas. The standard thickness of slat is 1.0mm. These slats are made from high tensile strength materials as a security barrier. The furnishing coat of heavy duty is galvanized iron, zincalume and powdercoating finish. The finishing colour of powdercoating is based on Hightex® Dynamic standard colour. The maximum size of shutter will be 12,000mm(width) x 5,000mm(height). Motorized operated is applicable for heavy duty shutter. Additional push button, remote control or back up battery can be added to suit customer requirements. Insulated heavy duty roller shutter with a total slat thickness of 21mm is available. The infill for the insulated slats is rockwool. Insulated roller shutter is applicable for oversea market, especially Middle East countries.